This is part 10 of a series on Vermeer’s and Rahmstorf’s 2009 PNAS paper, “Global sea level linked to global temperature“ (referred to as “VR2009″ in this series of posts). 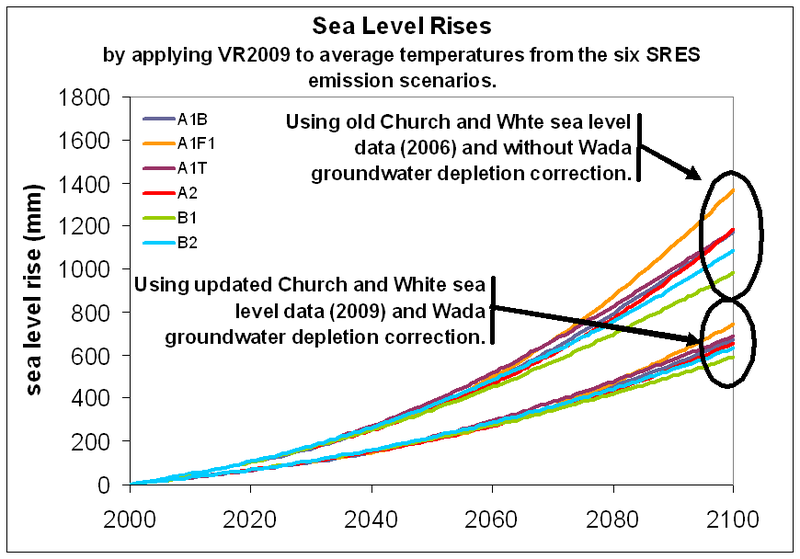 In my last post I pointed out that VR2009 used out-date sea-level data from Church and White, and did not include a correction for groundwater depletion. Even if you believe the validity of their very dubious model, these two flaws cause VR2009’s projections of sea level rise for the 21st century to be overstated by a factor of two. VR2009 said that they applied their model with their fit parameters to 342 temperature scenarios. How did they come up with 342? They borrowed them from the IPCC, who applied six IPCC SRES emission scenarios to nineteen Atmosphere-Ocean General Circulation Models (AOGCM) with high, medium and low-carbon cycle feedbacks (6 x 19 x 3 = 342). The six emission scenarios are the inventions of the IPCC and are summarized in the IPCC SRES (Special Report on Emission scenarios). Their differences lie in their assumptions about global economic, technological and social changes during the coming decades. Each set of assumptions results in different levels of CO2 emissions. Under some assumptions the use of fossil fuels will increase dramatically, but under others the use of fossil fuels will reach a peak in mid-century and then start to drop off. The amount of predicted CO2 in the air during the 21st century depends on more than just the CO2 emissions. It also depends on carbon cycle feedbacks. For example, warmer oceans would remove CO2 from the atmosphere slower than colder oceans, everything else being equal. The possible feedbacks are not necessarily well understood or well quantified, and each AOGCM model handles them differently. There are about 2 dozen prominent Atmosphere-Ocean General Circulation Models (AOGCM) made by various groups around the world. Each AOGCM purports to simulate the flow of energy and matter through atmosphere and oceans and therefore yield their evolution into the future. The SRES emission scenarios and carbon cycle feedbacks can be plugged into each AOGCM, which calculate various parameters, including temperature, for each year of the 21st century. The IPCC 4th Assessment Report used 19 AOGCMs, three carbon cycle feedback schemes with six families of temperature scenarios, one for each SRES emission scenario (19 x 3 x 6 = 342). These are the temperature scenarios used by VR2009. These families of temperature scenarios are summed up in the following IPCC figure. Figure 1. This is figure 10.26 from the IPCC AR4 Chapter 10, "Global Climate Projections." It shows the temperature projections for each of the six IPCC SRES emission scenarios averaged for the 19 AOGCM models and 3 carbon cycle feed backs and the standard deviations. I do not have the 342 temperature scenarios used to construct figure 1 and used by VR2009, but I am working on it. The most extreme of these 342 temperature scenarios falls under the A1F1 emission scenario, and yields Vermeer’s and Rahmstorf’s widely echoed 1.8 meter sea level rise for the 21st century. If I had the temperature data for that particular AOGCM/SRES emission scenario/carbon cycle feed back scenario, I would simply insert it into VR2009’s model using their fit parameters and then again using my fit parameters. Their fit parameters would yield 180 cm, and mine would yield about half of that. Instead I have digitized the IPCC temperature data shown in figure 1, above. My digitized version of the data is shown in figure 2, below. Note that I have translated the temperatures about 0.25° higher than in figure 1 because the IPCC used the 1980-1999 temperature average for their zero point (see IPCC AR4, chapter 10, section 3.1), but VR2009 and I used the 1950 to 1980 temperature average as the zero point. The following image is a reproduction of the IPCC temperature data shown in figure 1, and the data can be downloaded here. Figure 2. Reproduction of IPCC AR4 figure 10.26 from data digitized from IPCC figure. 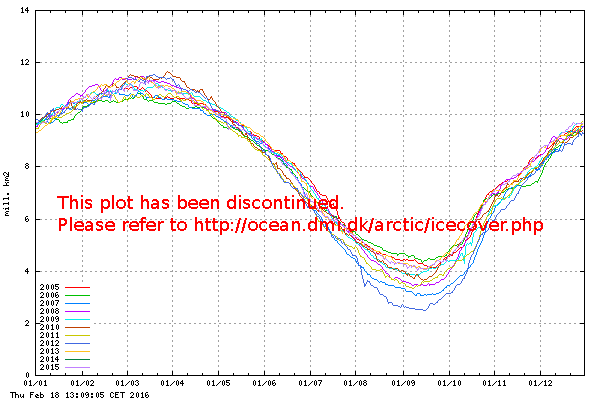 I have added about 0.25 degrees to change the zero baseline from 1980-1999 to 1950-1980. 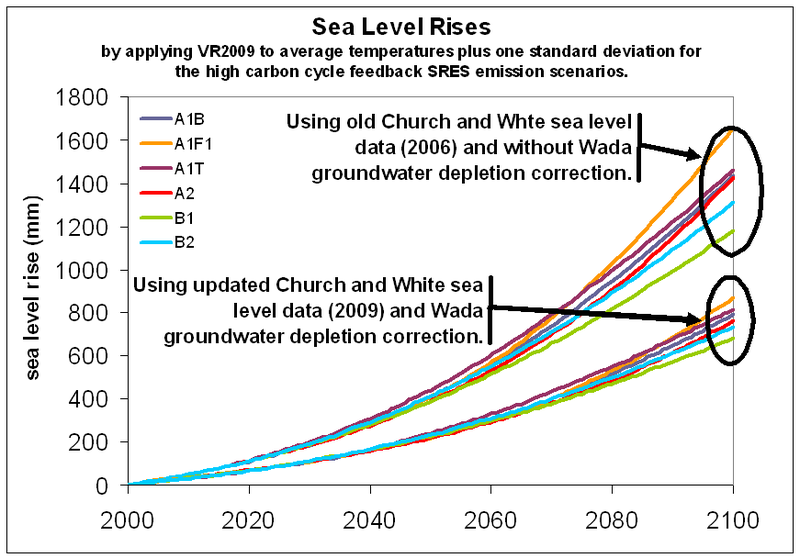 If VR2009’s model with their fit parameters (using the out-dated Church and White sea level data without the Wada groundwater depletion correction) and my fit parameters (using updated Church and White sea level data and the Wada groundwater depletion correction) is applied to the average temperatures (dark central curves) from the six scenarios in figures 1 or 2, then the difference in projected sea level rise is quite stark. Figure 3. Sea level rises from averge temperatures in the six SRES scenarios. Similarly, both sets of fit parameters can be used to calculate sea levels for the higher temperature scenarios that match the upper edge of the shaded areas in figures 1 and 2. Figure 4. Sea level rises for higher temerature scenarios. Figure 5. Using the proper sea level data cuts VR2009's sea level rise projections in half. It can be shown that this approximately 50% difference will occur for any of the 342 temperature scenarios the VR2009 used. Vermeer’s and Rahmstorf’s model is bogus for the many reasons that I have explained in previous posts. But even if the concept of their model were valid, it would still yield sea level rises that are two times too large when it starts with the out-dated version of Church and White sea data and neglects the correction for groundwater depletion. Surely Vermeer and Rahmstorf are aware of the updated Church and White data. That update occurred about the same time that VR2009 was published, and possibly before. It would be a simple exercise for Vermeer and Rahmstorf to update their fit parameters based on the updated Church and White data. It would be instantly obvious to them that their extreme sea level rise projections are far too large. Then they could write letters to the editors of the multiple publications that quoted their 1.8 meter projection and tell them about the lower numbers. 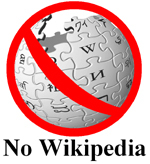 Or they could post some comments about the corrections on the endless list of blogs and websites that have repeated their extreme numbers. You would think that Stefan and Martin could get together and post an article at RealClimate with corrected fit parameters for their profound dubious model. They could bill it as “Good News:” maybe the world is not coming to an end after all.